Banh Mi (Vietnamese sandwiches) have long been recognized by BrokeAsses as a cheap, filling and delicious lunch option. Now you can make them at home with fresh, inexpensive ingredients—many of which you likely have on hand already. 1/4 cup rice vinegar $2 for 12 oz. 2 tsp Asian chili sauce $1.50 for 8 oz. Use a vegetable peeler to slice carrot and cucumber into very thin slices. Place sliced vegetables in a small bowl and cover with rice vinegar. Refrigerate for 20 minutes. Meanwhile, brush a grill or grill pan with vegetable oil and bring to high heat. Season steak well with a pinch each of salt and pepper. Cook skirt steak for 2-3 minutes on each side, or until dark grill marks appear and steak becomes juicy. Remove from heat. Mix together mayonnaise and chili sauce. Set aside. To assemble sandwiches, spread each half of the baguette rolls with the aioli mixture. 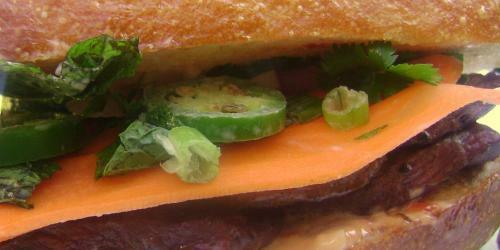 Layer the steak slices, carrot, cucumber, cilantro, mint and jalapeño slices on the bottom slices. Cover with the baguette tops. These were UNBELIEVABLY tasty!!! My boyfriend and I were in awe how well these turned out… fantastic and spicy dinner! I will definitely be making a lot of these sandwiches. I will definitely be making this buttercream once I have done my college essay work. That work has took up a lot of my time and I can’t wait until I have finished my work on that so I can make this cream as soon as possible.